In ‘hard water’ areas water contains calcium and magnesium salts, this typically varies in concentration depending on the geology of the location where the water is sourced. 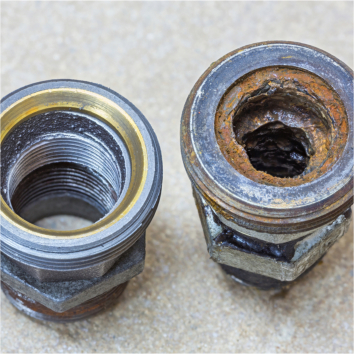 This ‘water hardness’ creates problems for commercial and industrial machinery over time. Typical symptoms include component wear, reduced efficiency, higher consumption of cleaning chemicals and energy, and machine breakdown. By removing the hardness of the water, the ‘softened water’ elongates the life of the appliances, ensures that they work to their specification longer and are less costly to run. Water softening is done very simply with the use of a water softener. There are different types of commercial dishwasher water softeners that are available on the market. Ultimately the type of water softener you need depends on your systems’ water usage and your particular site constraints. That said, our brief guide below should give you some idea of which is the best kind of water softener for you and your particular washer. We offer a number of commercial dishwashers that come complete with integrated water softeners. In most cases these dishwashers are identifiable as they contain an "S" within the product name. This water softener is designed by the manufacturer for typical machine usage and the highest levels of water hardness. The key advantage of these is no additional floor space is required to accommodate the water softener. Integrated water softeners use granular salt and can only operate up to 59 degrees Celsius. Manual water softeners come in 8-20 Litre size configurations and are suitable for nearly lower volume commercial dishwashers and glasswashers. We will advise you on what size of water softener will be most suited for you based on your dishwasher, frequency of use and the space you have. Whilst they tend to be the cheapest solution they take more time for your staff to fill with salt and regenerate. Manual water softeners use granular salt and can only operate up to 59 degrees Celsius. Automatic water softeners are fully automatic, metered electronic water softeners for use on any cold water supply (up to maximum of 59 Celsius) making them suitable for higher capacity commercial dishwashers. The key advantage with these softeners is that the regeneration process automatically happens out of working hours and without the need for manual intervention. Automatic softeners need a 13A supply and tabular salt. Also available are hot water automatic water softeners which work up to 65 degrees Celsius. Non electric water softeners are fully automatic water softeners for use on any cold water supply (up to maximum of 59 Celsius) suitable for medium to high capacity commercial dishwashers when an electrical supply isn’t available. The key advantage with these softeners is that the regeneration process automatically happens out of working hours, without the need for manual intervention and do not need a power supply. Non electric softeners need tabular salt.